We spend at least one-third of our lives working. But what makes work meaningful and rewarding? Career expert Donna Dunning writes that work is satisfying if it interests you and allows you to do the things you enjoy. But she also notes that work that is interesting and enjoyable for one person may be totally unsuitable for another. She states that is because of people's differing personalities. 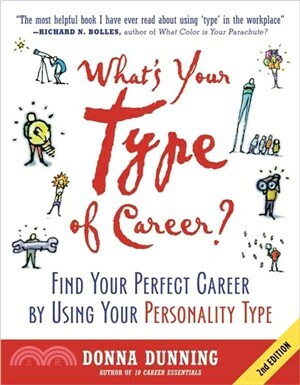 Whether you are just starting out, looking for a change, exploring business ideas, or thinking about retirement activities, What's Your Type of Career will show readers how to find work in that perfect career. Donna Dunning, PhD, is an author, consultant, certified teacher, and member of the MBTI AR International Training Faculty. She worked as a psychologist for over 20 years, specializing in the areas of career development, learning, and work performance. Donna is the author of more than a dozen publications. Her newest books are 10 Career Essentials and What's Your Type of Career? 2nd edition.